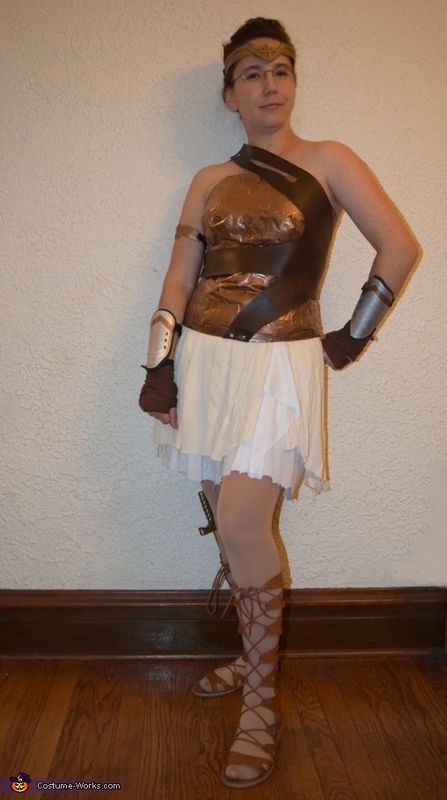 For Halloween I was the Amazon version of Diana, aka Wonder Woman, based on an outfit seen in this years' movie. My outfit was completely self-made, except for the shoes, headband, and armband. The bronze body "armor" of my outfit is a duct tape body form (ultra thick...it used up three rolls) wrapped over an old t-shirt. The back has faux leather stitched on, with eyelets and feax suede lacing to close it. My body straps are more faux leather, connected with metal brads, and the skirt is knife pleated gauze fabric. My arm armor is an old pair of my son's shin guards, spray painted to look like metal with suede fabric arm and wrist wraps. My old She-Ra sword from when I was little was my weapon!